I don't think I'll be writing a Les Misérables movie review. I’ve seen the movie in cinemas three times now. Though the stage show remains my true love, I think the film's good. But who needs another voice in the choir praising Anne Hathaway’s Fantine or criticising Hugh Jackman's Bring Him Home anymore? It's all been said already. Instead, let's talk a bit about being a Les Misérables fan. Les Misérables has a lot of flaws. Despite them, it's been my favourite musical for four years. Every now and then, I think I'm now fed up with the whole thing, and then catch myself listening to some cast recording two days afterwards. I can't stop loving Les Mis. "I'd like to recommend not getting too excited about this. With little googling I already found out he [Cameron Mackintosh] has announced a Les Mis movie in 2009 (with Russell Crowe and Hugh Jackman in the main roles, apparently) and in 2005, and there even was a mention of a Les Mis movie ad campaign in 1991." Little did I know this was finally the one that would come true. Us fans of the stage show have always known Les Misérables is the planet’s most popular musical. But now, after the movie has premiered, we can suddenly see it. All of a sudden, everyone's friends, classmates and relatives know Les Mis the musical. 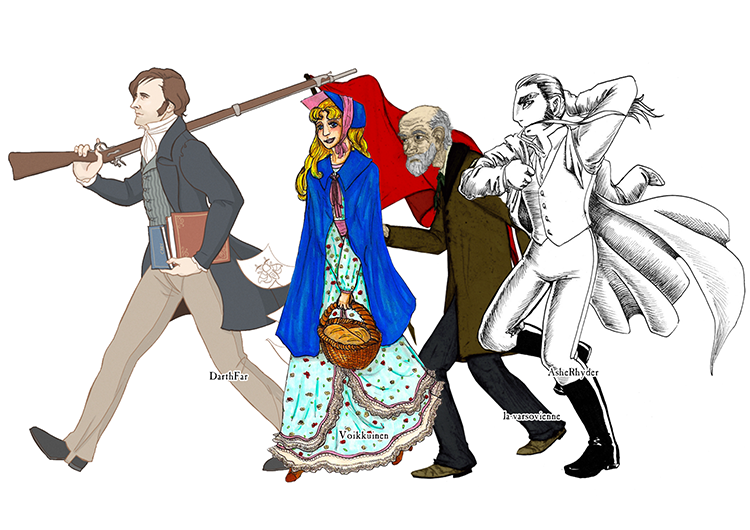 The size of the Les Misérables fandom has exploded. 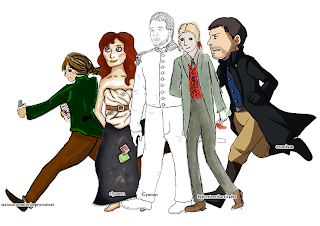 Before, it was a neat acchievement if twenty people aknowledged your Les Mis fanwork existing. Nowadays, the average Les Mis film gifset gets a thousand notes in Tumblr. Apart from introducing the story to new people, it seems the movie actually brought the fandom closer to each other. Speculating together about every new paparazzi photo and promotional image was plenty of fun. I don’t think I’ve ever felt as close to my fellow Les Mis fans around the globe than when we watched the livestream from the London premiere red carpet and liveblogged the experience together. For me, that was honestly better than watching the actual movie. Seeing things like the original cast Marius interviewing the movie Marius, and getting to scream about that with other fans in real time... The movie itself was worth the wait, but the waiting was worth a lot more on its own. If I'm completely honest, I didn't feel much anything when I finally sat in the cinema and waited for the film to begin. I didn't feel particularily excited during the movie itself either (apart from Stars, which I found so good it reduced me to a sobbing mess). Maybe I was actually a bit sad that the wait was over. Or maybe I just had used all my excitement up months before already. I don't mean all fun ended after we couldn't speculate anymore, though. 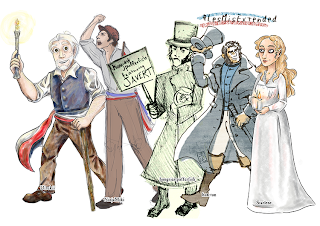 The pictures featured in this blog entry are parts of the LesMisExtended Visual Petition. 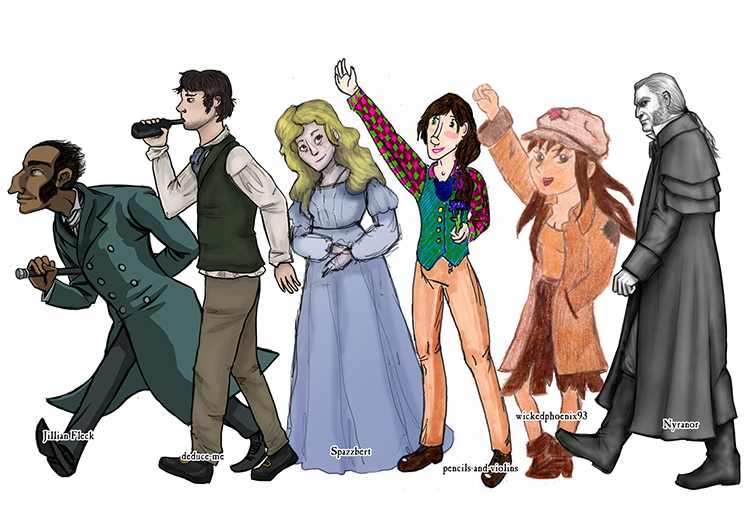 It's visible proof of the movie bringing the Les Mis fans together, and a project I'm very proud of. Les Mis is one of the longest musicals out there, so the movie made many cuts. They were well done, you only noticed something's missing once or twice. But, since we know many things were cut only after filming... Of course people are curious to see how the movie actors handled the missing bits. When Tom Hooper hinted that if the fans are interested, he might consider releasing an extended cut of the movie, me and one of my online friends decided to do something. We started a visual petition. Anyone could show they want to see all that was filmed by drawing their favourite character. I was floored by the number of characters people sent in (and so was my Photoshop and deviantART's file size limit). We've now sent prints of the whole thing to Tom Hooper and can't but hope they reach him. But even if they don't, the project still looks amazing and shows how much talent there is in the fandom. Just look at all the different ways the same characters are portrayed there! And honestly, this is what being a fan is all about, to me at least. Taking something amazing and using it for inspiration. It was nice to see the Les Mis movie on a big screen, but it was way better to discuss it with my friends afterwards. Just as it's amazing to see the show live, but at least just as good to review the performances, to draw fanart based on it, to share the experience. Les Misérables the musical takes itself completely seriously. So much so that I doubt I would find it enjoyable anymore without the fanart, the discussion, the jokes... I love the songs and the characters, and whenever I see the show live, I enjoy it so much I can hardly sit still – but even then, it feels a bit heavy sometimes. Drawing a comic where Enjolras has superpowers or just giggling about some miserable pun balances the pathos out nicely. It's weird how much a single musical can give to a person. 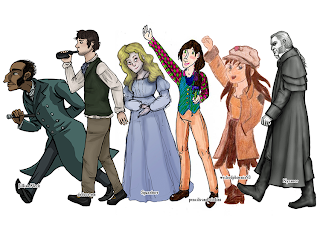 Without Les Mis, I wouldn't know some – if not the majority! – of my good friends. Without that sorrow-drenched story of a bunch of French people dying, I would have a lot less fun in my everyday life. I'm glad I got to be there while the movie was made, from the first announcement onwards. Getting a good film out of that was a nice bonus.